Commerce's National Institute of Standards and Technology (NIST) has issued a new publication that broadens agency security options for Personal Identity Verification (PIV) cards. 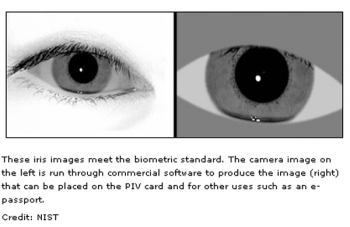 Biometric Data Specifications for Personal Identity Verification (Special Publication 800-76-2) adds iris images as biometric identifiers and on-card fingerprint comparison as options for the cards. A PIV card is a government-issued smart card used by federal employees and contractors to access government facilities and computer networks. The PIV card carries a photo, fingerprint information, personal identification number (PIN) and a cryptographic credential–random computer-generated data that are recognized only by the PIV card–all of which serve to bind the card to the card holder. Submitted on July 15, 2013 - 5:51pm. I am against any employee, state employee or not, in Montana being forced to have any of their biometrics used as identification. Fingerprints for security especially when dealing with children, elders or sensitive information is one thing - but this is a different matter. Several years ago out great state helped to stop the Real-ID - however with the possible implementation of this PIV, it is essentially one and the same except we are doing it to ourselves this time. First of all this is an invasion of privacy and secondly Montana is a sensible and God-loving state and should adhere to as much of the Bible as possible; whether the state knows it or not this is the beginnings of the mark of the beast the Bible prophesies about in Revelation.